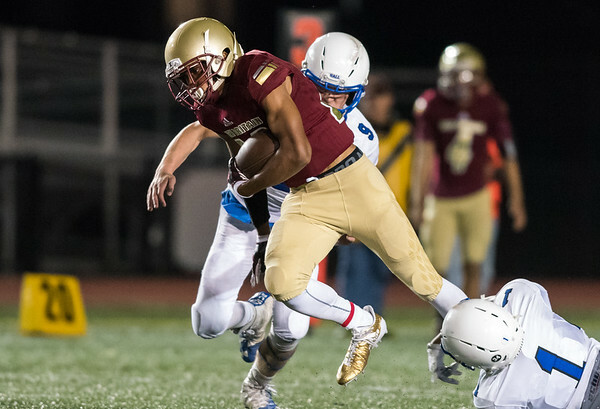 NEW BRITAIN - New Britain alum Jaylen Rivera will be staying local for college. But before the two-sport athlete continues his career at Division-II Post University in Waterbury this will, he was awarded with the 2018 Osgood Shootout scholarship. The Osgood Shootout scholarship is handed out to six graduates every year. While at New Britain High School, Rivera participated in sports every season - football in the fall, indoor track and field in the winter, along with outdoor track and field in the spring. Rivera said the Osgood Shootout is a great event for the community and he enjoys coming to it every year. But the Osgood Shootout isn’t just about basketball, it’s about bringing the community together. In just a matter of days, he will be taking his athletic careers to the next level. During the fall he will be a part of Post’s sprint football team. There, he will be a defensive back and wearing the No. 15. Post University is one out of nine other universities and colleges that offer spring football. During sprint football, players must maintain a weight of 178 pounds or less and have a minimum of five percent body fat to be eligible to play. The end result of these weight restrictions is that, unlike conventional collegiate football which places a premium on body weight and strength, sprint football emphasizes speed and agility. During the spring, he will be taking part in the Eagles’ track and field team. In his senior season of outdoor track for the Hurricanes, the sprinter made the All-CCC team after a handful of top-10 finishes in the 100- and 200-meter dash. He finished with one of the best seasons in New Britain history after moving into the top-10 in both events. Although sports are at the top of Rivera’s list, so is education. While he is in school he will be study sports management. “It’s a great opportunity,” Rivera said. Posted in New Britain Herald, New Britain on Wednesday, 22 August 2018 21:05. Updated: Wednesday, 22 August 2018 21:08.